Lead singer of Lovely Killbots and disco house producer Mix Chopin have been inseparable since their very first conversation about vintage space echoes nearly two and a half years ago. From that day forward, the couple affectionately refers to their love-at-first-conversation moment as “You had me at space echo”. When they met, the band was in the midst of recording their sophomore album with producer Gavin Brown while Mix Chopin aka Mick was putting together his debut EP “Love Story” and garnering much attention in the french disco house scene. Coming together through a love of music and a mutual respect for each other’s projects, the remix was an inevitable and exciting collaboration between the two. 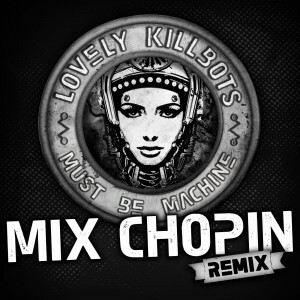 Made with love, Lovely Killbots and Mix Chopin are proud to present the official Must be Machine remix. Mix Chopin takes the band’s dark and tribal album track “Must be Machine” and transforms it into a sultry and robotic masterpiece.